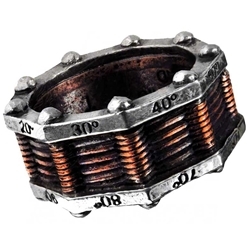 The Hi-Voltage Toric Generator Ring is an unusual, early, highly efficient power generator to augment the energy demands of Victorian hi-tech gadgets. This gothic ring is made from fine English pewter with a 2-tone finish. An advantage of this pewter GMT Fermonic Field Detector Ring is that it does not need regular polishing to maintain its gorgeous appearance. Pewter jewelry does not tarnish like silver jewelry. To keep your gothic GMT Fermonic Field Detector Ring bright and shiny, an occasional cleaning with a quality proprietary metal polish will keep it looking brilliant. This pewter gothic ring is made in Sheffield, England and crafted by master craftsman. Our products are researched, conceived and designed in England. They are made by highly skilled hand craftsmen in England. The Metal used in the manufacture of all of our pewter products is the highest grade, 92% tin alloy, better known as "English Pewter". Pewter, like silver, may tarnish but can easily be polished up to a brilliant lustrous shine using a brass or silver polishing pad and a wipe with a dry cloth. Do NOT put pewter into a salt water dishwasher, which could corrode a polished surface. If taken care of properly, you should have years of wear for any Gothic, Medieval, Renaissance Romantic Dinner Party or a Great touch to your bedroom for a romantic evening. Great gift idea for any Birthday, Graduation, Anniversary, Weddings, Baby Showers, Girl's Night Out, Sweet Sixteen or any party occasion.